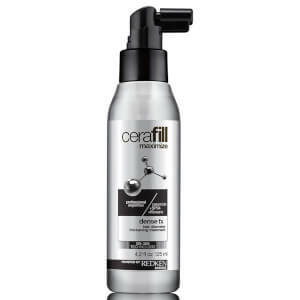 Thicken thin hair instantly with Cerafill Dense Fx™ Hair Thickening Treatment. Featuring Cerafill System Technology, the treatment utilises Ceramide to strengthen fibres, preventing breakage and energising hair follicles to instantly re-densify hair. The breakthrough formula powered by Filloxane plumps existing hair and expands fibres to increase diameter by 9% to create fullness and density. Suitable for all hair types, the thickening treatment also nourishes to promote a healthy scalp. Apply daily to damp hair section by section beginning at scalp. Massage gently at root and work through to the ends, re-apply for optimal results. Do not rinse. Layer any additional styling products. Style as usual.